Here's a delicious Regency combined with a dash of spicy Italian seasonings! Pride And Prejudice: Because of the Sicilian tradition of “Fortuna”, Lexia Cappello believes she is destined to marry her stepbrother, the Marquess of Rutherford. Robert Weston, however, has a ready dislike of anything or anyone non-English. Can she convince this obstinate lord that his ignoble prejudice stands in the way of his future happiness? All In The Family: At first Robert Weston is annoyed, then intrigued by his new-found Sicilian stepsister. The more he resists her, the more he finds he yearns to possess her. 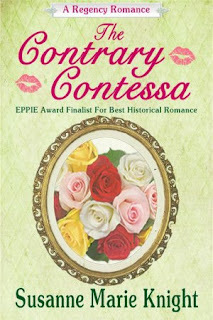 Can he overcome his pride to admit the error of his ways and win the Contrary Contessa’s heart? Robert visits to his father's Sicilian house for the first time in 16 years. Unbeknownst to the occupants of the house, he's come to collect his father's children from a second marriage. Robert is vaguely aware that he has a stepsister but has never met her. About to ferret out a pot of coffee, Robert stopped. Chattering nonstop from a chair by the outside door was the most astonishing slip of a girl. What she said, he had no idea, but speaking in rapid fire Italian to someone evidently named Zia, she removed mudstained shoes. Her toes, brown and sturdy, wiggled joy at their sudden freedom. The girl’s dark straight hair, braided in a long strand to her slim waist, hung down to touch the floor even as she brushed dirt and grass from her feet. Dressed in peasants’ clothes, she wiped her hands on a soiled apron that outlined her slender hips. Her bosom, however, was quite... bountiful. Without thinking, he ran his tongue over his upper lip. She was undoubtedly a tasty morsel--one that he was eager to sample. Rumor had it that these Sicilians were a passionate breed. He wished to discover that for himself. She looked up at him and gasped--all doe-brown eyes and adorable pink lips. Even as she stared, her eyes widened and her hands flew to her sun-kissed cheeks. By the rise and fall of her voluptuous bosom, she would, no doubt, be a spirited conquest. Inhaling her intoxicating flowery fragrance inflamed every inch of his desire. The wine swimming in his head, the promise of the girl’s sweet nectar, and her liquid brown eyes all overruled any restraint he might have had. He leaned closer, to steal a kiss. From out of his fog of passion, he heard her speak. “Bella,” she said in her musical voice. “Bella?” he breathed, so close to achieving his goal. Her sparkling eyes almost mesmerized him. “Sì, bella.” Stepping away from him, she poured water from a pitcher into a bowl and washed her hands. He jerked his head back. No woman of his acquaintance had ever walked away from his attentions! And to do so to perform such a mundane task! Well, that was outside of enough. Just his wretched luck to try and seduce the one scullery maid in all of Sicily who spoke English. But still, by her heavy breathing, as indicated by the sensual flutter of her breasts, she was not indifferent to him. She had a similar fire igniting her natural desire. He would humor her. “Bella signorina. Do I have it right now?” He curved his lips into a rakish smile and followed her over to the fireplace. She would feel like heaven in his arms. “The devil!” He could not help expostulating. Married? This young chit? But on her ring finger gleamed a slim band of gold. He was not so debauched as to force himself on a married woman.